I went to the gym the other day and saw a few people working out with headphones on. It seemed that listening to their favourite music while working out helped to improve their workout performance. Or perhaps to cure their boredom. Whatever the reasons, it was fine with me until a guy came next to me while I was doing some seated dumbbell presses. I could hear the strong rhythmic beats coming out from his headphones and he was standing a few feet away! Now I am not complaining about noise pollution here. All I’m saying is, does this guy treasure his ears? If he’s trying to exercise his ear drums, it’s surely a damaging way of doing it! 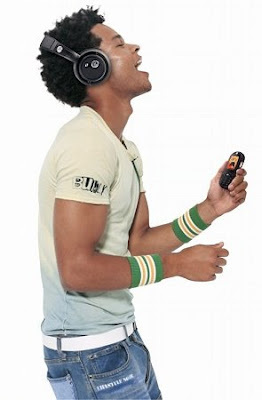 There have been many reports stating that listening to loud music through headphones is a common cause of hearing loss. And what is worse is that you won’t realize you are losing your hearing because the effect is not instantaneous, but is progressive over time. Hearing damage usually results after long-term exposure to loud noise, but according to Merck website, even brief exposure to extremely loud noise can permanently harm hearing. So how loud is considered loud and damaging to our hearing? Here’s how we measure loudness. It is measured in decibels (dB) based on a logarithmic scale. This means that an increase of 10 dB represents a 10-fold increase in sound intensity, and a doubling of the perceived loudness. Thus, 20 dB is 100 times the intensity of 0 dB and appears 4 times as loud; 30 dB is 1000 times the intensity of 0 dB and appears 8 times as loud. 0 dB - the faintest sound heard by human ear. 30 dB - whisper, quiet sound of a library. Generally, protection is recommended for sound levels above 85 dB. How would you know if you are not already suffering from some hearing loss? Well, if you experience the following symptoms, it may be serious enough to warrant an appointment with your ear doctor. Difficulty understanding speech in noisy places or places with poor acoustics. So the next time you wish to listen to your favourite songs on the headphone, remember to turn the volume down a few notches! I once read that if you could hear the music or sound coming from another's headphone, then that is considered too loud already. Nice post. Thanks for info. i read that u shouldnt put on more than half the 'volume' on the scale of ur mp3..
btw, why is this tags in front of all ur paragraphs? happysurfer, yes that's true. Thanks for your comments. cbenc12, I think that's good advice too. I don't see the tags - how come you see them? I agree with Happysurfer..there are also drivers with really loud music blaring from their cars with their windows wound up..now, that's way too loud. Also, ppl shouldn't exercise outdoors with their headphones on...dangerous as you tend not to hear or be aware of your surroundings. my bug life, drivers with loud music blaring - I don't know what's with them. Agree with you it's dangerous to use headphone while exercising outdoors. MBL, and I agree with you about the safety part of it. Foong, I see the tags too - probably because I'm using IE v6? And Nike is encouraging the use of iPods when running. It has specially created Nike Sports Music for download. I mention it in my latest post. Sometimes, I can hear my neighbor playing music (actually making the music). So, I hear it through his window across 2 driveways and through my window. Now, you have to think that once the sound is outside it disperses some, so I can't imagine how loud it is in their house! While he was taking care of the health of his body by working out, he was also destroying his hearing with loud music. With mp3 players becoming an essential of our life, it's no wonder some got carried away and tune the volume to the maximum. There should be a campaign to educate and remind people on this issue. That certainly not a problem for me. I seldom use headphone or earphone. I do not even have a mp3 player. I would prefer just switch on my Hi-Fi, but of course with controlled volume. happysurfer, I still don't see the tags. I simply don't know why? eastcoastlife, what Nike do is very dangerous. Listening to iPods while running is definitely a health hazard! toni, I guess the music must be deafening in your neighbour's house! They are going to suffer hearing loss if they keep doing that. cc, yes the Government should start an education campaign on this. Most youngsters love to listen to loud music. johnny ong, I guess most people will only realise this much later in life when they suffer from hearing loss. jam, good for you! I really think we should limit our use of headphones. Ha Ha , very informative! I used to listen to music on my walkman using earphones - full blast! Now if I go to clubs or to concerts, if the music's too loud, I would feel vibrations in my ears (left especially) and I would have to stick my finger in it. Not painful but uncomfortable and irritating. I think my eardrums damaged liao!!! Yeah, headphones are bad for health when the volume is too high. I also hate drivers that drove past with loud blaring music! When I plug in my earphones, I can still hear people beside me talking. Yeah, I don't put it too loud because I was told to protect my ears (I was banned from owning stuff like walkman, discman, mp3 initially) before my parents gave their consent for me to buy one. So those people who think they can talk bad about me when I'm listening to my mp3 can think again! Haha. suituapui, the damage is done I'm afraid, but I guess you can prevent further damage by letting your ear drum rest more often, ie. go to quiet places more. eiling, i dislike drivers with loud music blaring too. day-dreamer, looks like turning down the volume helps not only to protect your ears but actually you can eavesdrop on other people's conversation since they think you can't hear them - not bad! haha! lufs upload a wav and return is al list of values measured.